Falanghina is an ancient varietal, reportedly of Greek origin. It is believed to be the grape variety behind Falernian, the most famous wine of Roman antiquity.There has been a renaissance of interest in Falanghina since the turn of the century and this once venerated grape is becoming increasingly fashionable. The vines thrive in the porous volcaninc soils and the warm Mediterranean climate. The Nativ Falanghina has a medium yellow color with greenish reflections. On the nose the bouquet is rich and intense with hints of apple, pineapple and citrus. It is fresh and clean in the mouth with a crisp acidity and lasting finish. It is a versatile wine that is sure to please as an aperitif, with hors d’oeuvres, seafood and shellfish dishes, salads, buffalo mozzarella and fresh cheeses. Serve well chilled. 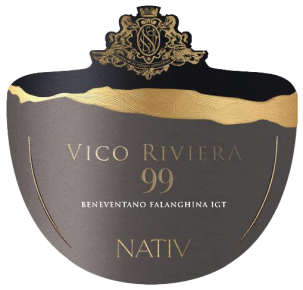 ‘Vico Riviera 99’ takes its name from a small alley (‘vicolo’ or ‘vico’ in Italian) located in the area of Castelfranci, near Paternopoli. Harvest is done by hand towards the end of September. Soft pressing of the whole bunch, cold static decanting and fermentation through selected yeasts at controlled temperature. In stainless steel for 3 months.